Tagging and tags are a fresh approach to categorizing and grouping things. Tagging allows the user to label thing with their own words. They don’t need to conform to keywords or categories created by somebody else. Tagging allows you to describe what you’re seeing in your own words, to imbue the experience with your own meaning. 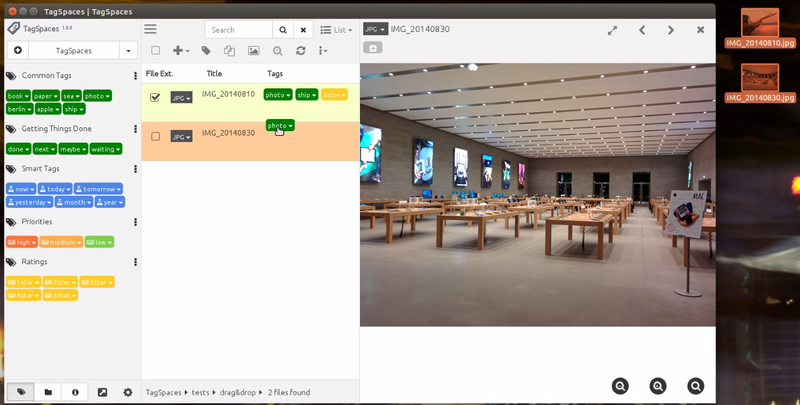 Tagging saves your time, and can makes searching for a specific song, movie, book, document, note, or whatever you’re looking for, much easier and faster. Tags are personal things. Tagging something is your emotional response and not simply a taxonomic decision. With using tags, you have the control to define things for yourself, and on the web -- not only for music, literature, games and movies, but also public websites, data repositories and consultations. Tagging is a new indirect way of control to express your mind and to name things your way -- you can call it a form of "freedom of speech", if you want to go that far. Tagging is a power to create your own genres in movies, music popular culture, or basically anywhere. TagSpaces supports tagging of files in a platform agnostic way. It uses the name of the file to save this kind of meta information. As an example if you want to add the tags vacation and alps to a image named IMG-2653.jpg, TagSpaces will simply rename it to IMG-2653[vacation alps].jpg. File renaming is of course a rather controversial decision (see our users discussion), which has its own limitations (e.g. on some operating systems the file path length is limited to ca. 256 characters), but it allows a portable way for adding tags on every platform, be it offline, online, or even cloud based. Such timestamps make it possible to easily group files from different locations based on the time of creation. Of course this would be possible by reading the same information from the file system, but tagging with the timestamp allows for greater flexibility. For example you can change the timestamp to anything you like, while keeping the original creation modification date of the file, and tagging the file will allow you to use TagSpaces&apos;s powerful grouping and organizing features in the same place you manage other tags. to access a popup dialog, that allows you to manage tags on the file. This popup dialog will not display the currently active tags, but allows you to specify tags by name, offering suggestions based on tags currently in the tag library. Shortcuts can be single characters, key combinations, or sequences of two or more characters. To specify a single key shortcut, type that key into the box. E.g. to set the key a as a shortcut for a tag, simply type the letter &apos;a&apos; and press OK.
For key combinations, type all keys separated by a plus sign (+). E.g. to specify Ctrl+Shift+a (to be pressed simultaneously) as a shortcut, just type "ctrl+shift+a". To use character sequences, type each character, separated by a single whitespace. for example, when you set a b c as a shortcut, you would need to type the letters &apos;a&apos;, &apos;b&apos; and &apos;c&apos; after one another to tag a file. You do not need to do this quickly, as long as you do not press anything else, the sequence will be recognised. This feature can be quite useful for users, who experience difficulties pressing certain key combinations. Note: Modifier keys, such as Ctrl, Shift, etc, can be used in sequential combinations. Specifying e.g. ctrl a would make a shortcut of pressing Ctrl followed by a. pressing the keys simultaneously would not work in this case. Using keyboard shortcuts can also work on multiple files. If you select more than one file, the tag bound to the key(s) or key combination you press will be applied to all of them. Note: Keyboard shortcuts can not be used to remove tags, only to assign them. Smart tags are one of the advanced tagging features of TagSpaces. Smart tags can be either date and time, or location based, and offer convenient dynamic tagging tagging, based on a range of criteria. today, tomorrow and yesterday** will apply a timestamp with the current, the next, or the previous day&apos;s date, in the format of YYYYMMDD, e.g. 20170314. Note: Every newly created file will automatically have a smart tag, equivalent to now. These special tags are useful for organising files by either importance or quality. You can apply priorities high, medium and low, and start ratings from 1start to 5star. Star ratings are yellow by default, whereas priorities are colour coded to easily distinguish visually. Users can easily extend these tags: You can simply create a new tag and add it to e.g. the priority group, give it a name a colour and a key binding, and you are all set. As alternative to saving the tagging information in the file names, TagSpaces PRO offers saving this kind of meta information in a sidecar files located in a hidden .ts folder. This option can be activated in the settings of the application as shown in the following screenshot. Note Please note that by default the .ts folder is hidden only on OSX and Linux operating systems, on Windows folders the preceding dot in front of the filename will not mark the file as hidden by default. Setting these folders as hidden on Windows can be achieved manually or with custom script if needed. After the activation, the application will create an extra file for every tagged file, having the same file name as the source file but with the additional JSON extension. For example after tagging some files in some of your file locations you will have a similar file structure. The main advantage of this solution is that the name of the files is not altered by tagging and there is theoretically no limit to the amount of tags you can add to a given file. 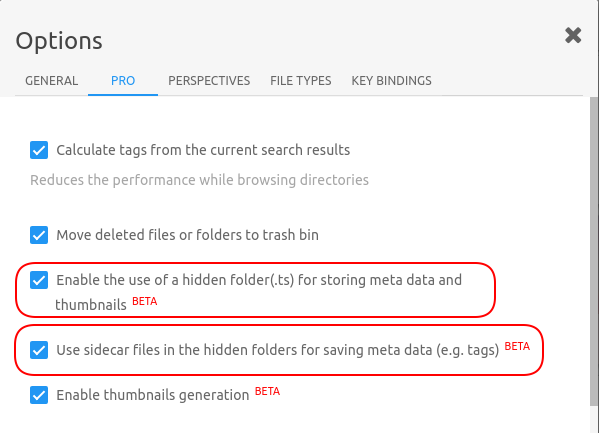 However this approach might also has its own drawbacks: If you move or rename tagged files in TagSpaces it will take care of the sidecar file, which will also be renamed or moved in the appropriate folder. But if you move, rename, or delete a file in an external applicaiton, you have to move, rename, or delete the matching sidecar file in the .ts folder manually. Hint If you want to have the files located in the .ts folder synched with some cloud service such as Dropbox or Google Drive, you will have to enable the synching of hidden folders and files. In TagSpaces PRO, it is possibly to apply tags to folders. To tag a folder, just presss the info button in the top navigation bar, next to the folder&apos;s name (1). It should open the folder properties area, where you can directly apply tags (2). Note drag and drop support is not currently implemented for folder tagging, you must specify the desired tags manually.